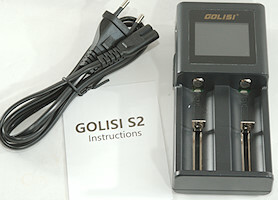 A 2 channel universal charger from Golisi. It arrived in a black very stylish cardboard box, there is some specifications on the back. The box included the charger, a mains cable and the instruction sheet. 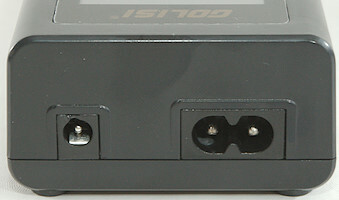 The charger has universal mains (110-240VAC 50/60Hz) and a 12V input on the back. 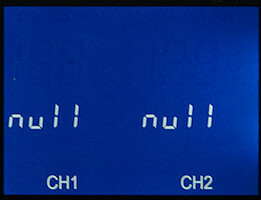 The user interface is two buttons and a large display. 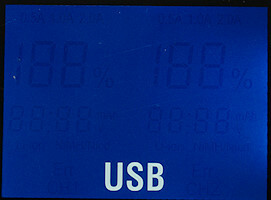 The buttons can be used to change what is displayed, but do not affect the charging. Current selection depends on number of batteries and chemistry. During power on all the segments are shown. Empty charger and with a LiIon and a NiMH battery. 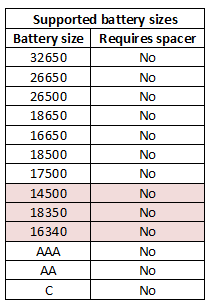 Current is selected depending on number of batteries, slot and chemistry. 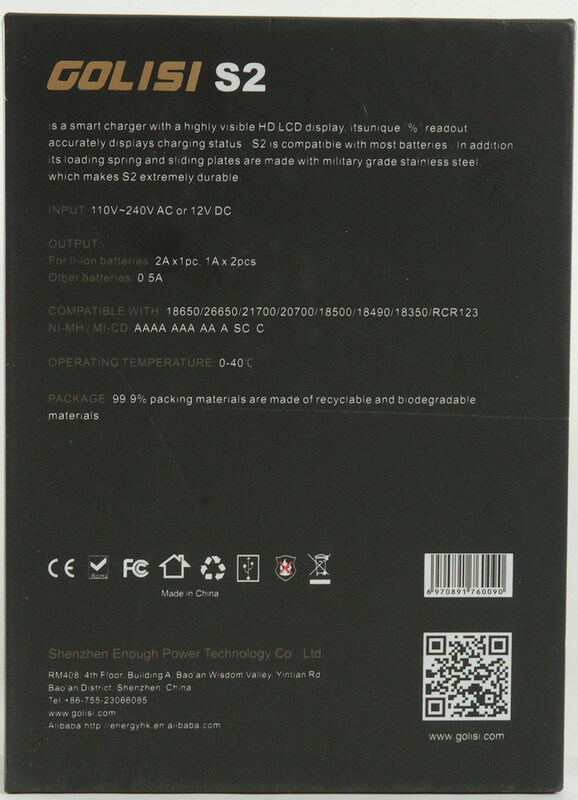 The charger do also support power bank function. On the bottom of the charger there are specifications. 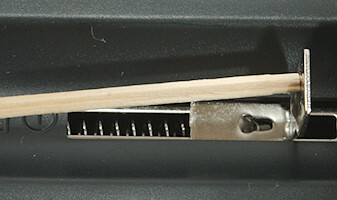 The slots can work from 32mm to 70.6mm. This covers unprotected batteries, but some protected will be too long. 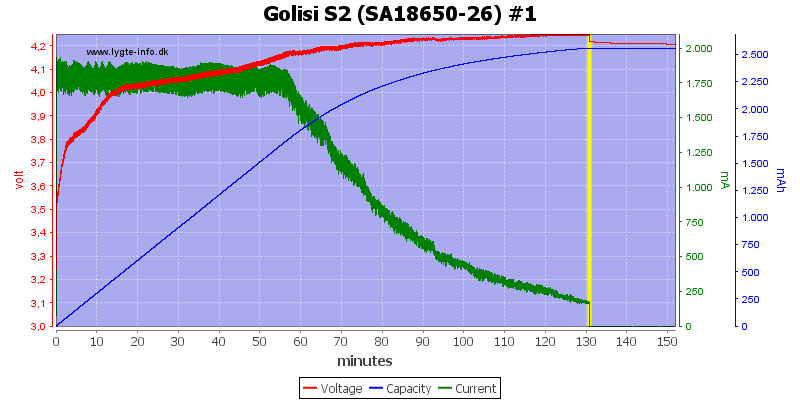 The charge current for 1 cell is 1A when using #2 slot or both slots, this is rather high for small cells. D cells may or may not work, they have a tendency to slide above the positive connection. 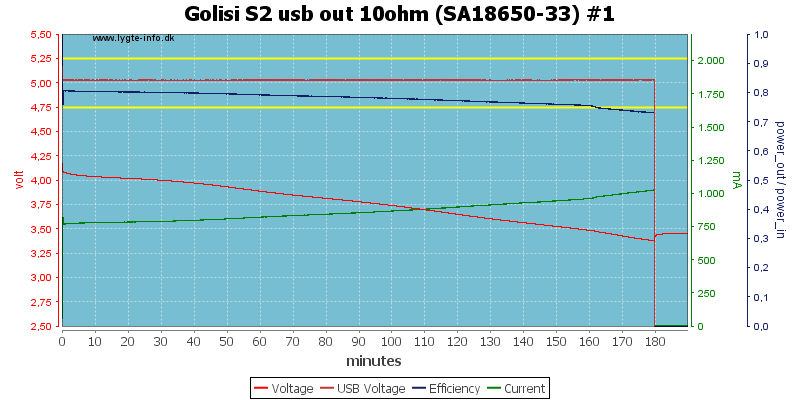 Discharge LiIon battery with 1.4mA when not connected to power. 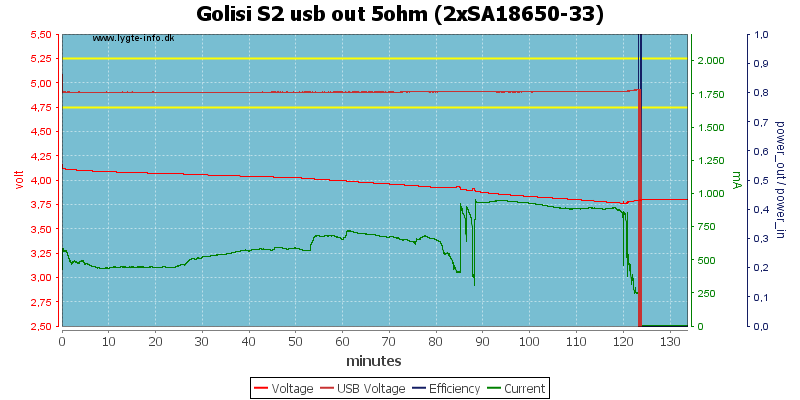 When power is connected with a full battery, it will charge with about 0.4mA. 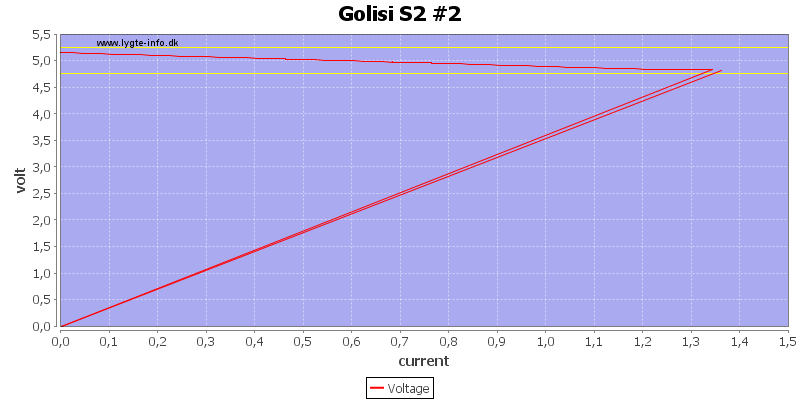 Above 2.2V the charger will assume LiIon. 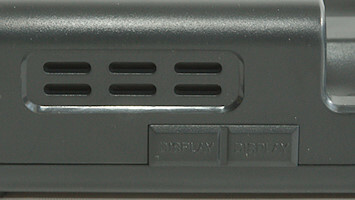 A slot with a battery will not increase current when other slots are finished (Good). Display turns off after 30 seconds. 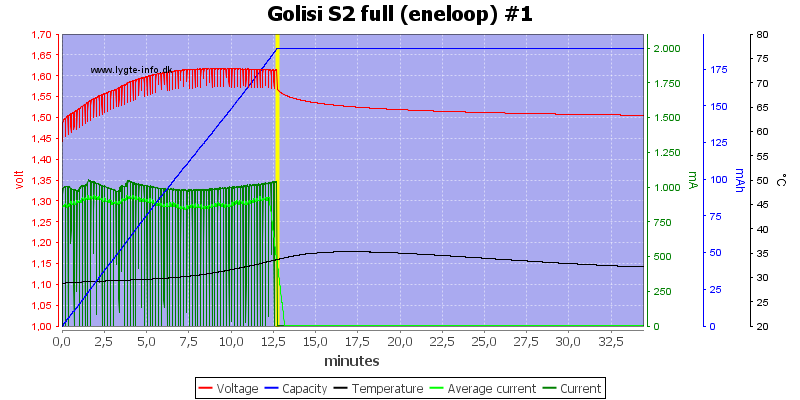 A single LiIon in is charged at 2A in slot #1. The display turns off after 30 seconds (This can be disabled). 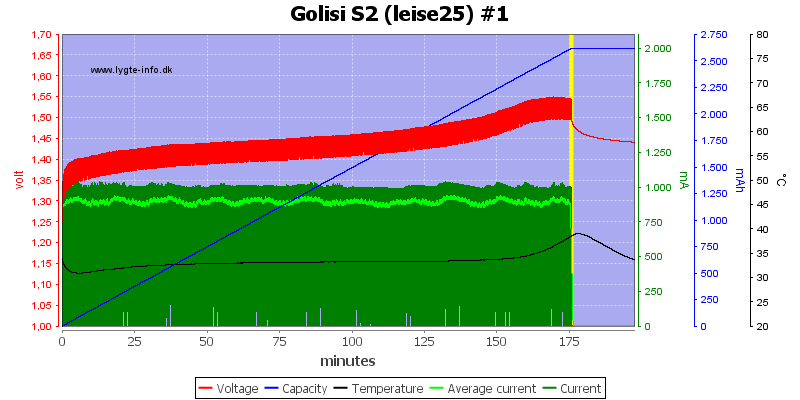 Power consumption when idle without battery is 0.22 watt (0.54 with display on). 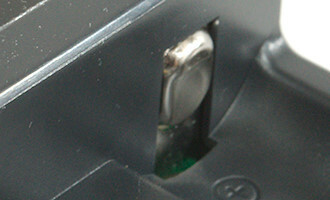 Charge current is 2A or 1A, depending on number of batteries and slot. 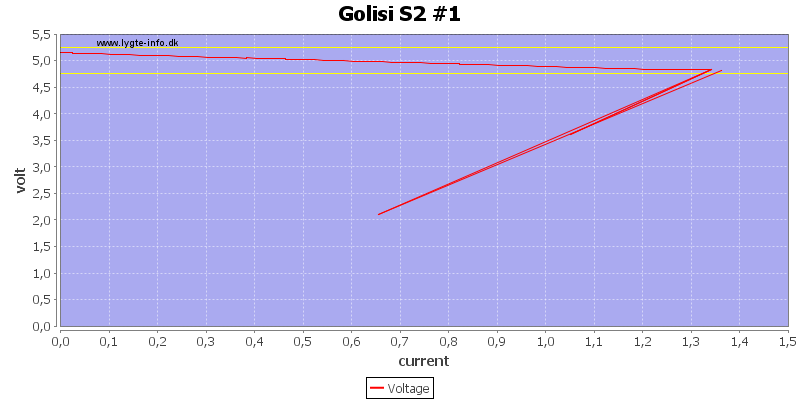 A CC/CV charge curve, the final voltage is at the top of the allowed range (4.25V) and the termination current a bit high at 190mA, together the result is a fully charge battery (At least for this cell). 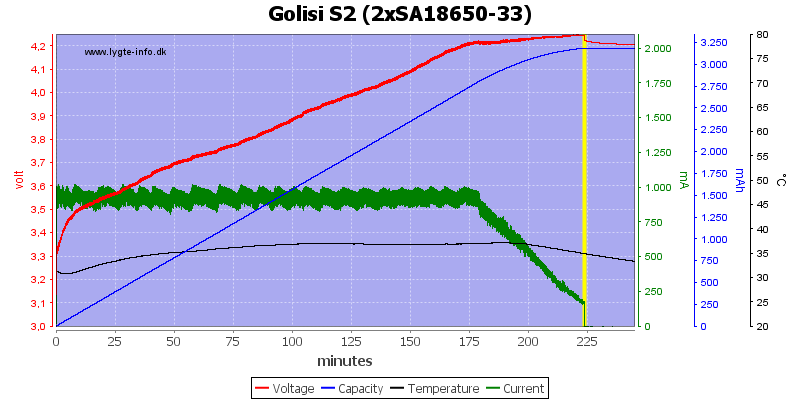 No problem with the 2600mAh cell. 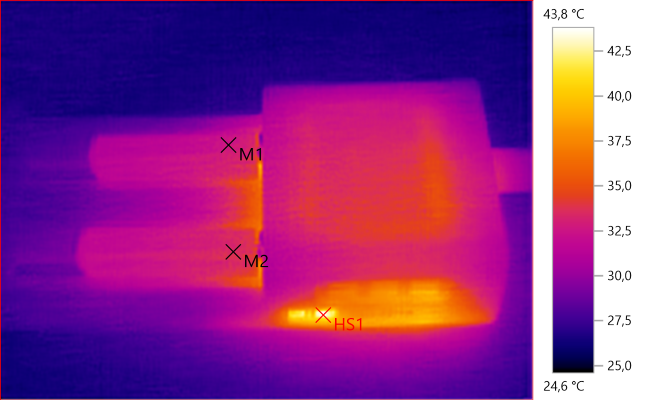 This slightly older cell drops significantly in voltage due to the high termination current. This old cell handles the high termination current better. 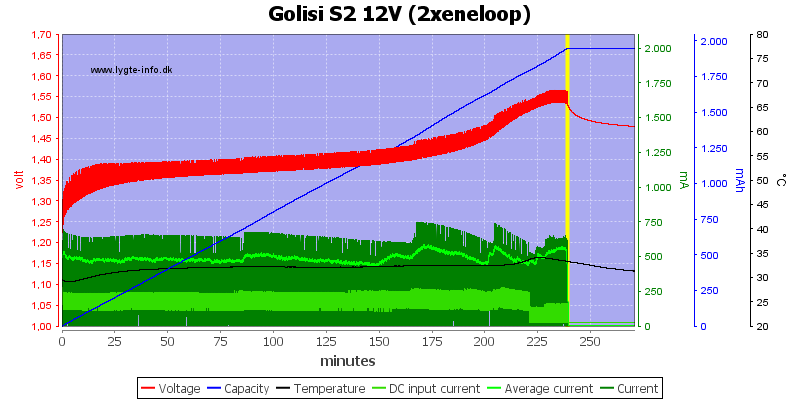 A high current 20700 cell do not drop much. Two cells at the same time means 1A charge current in both slots. 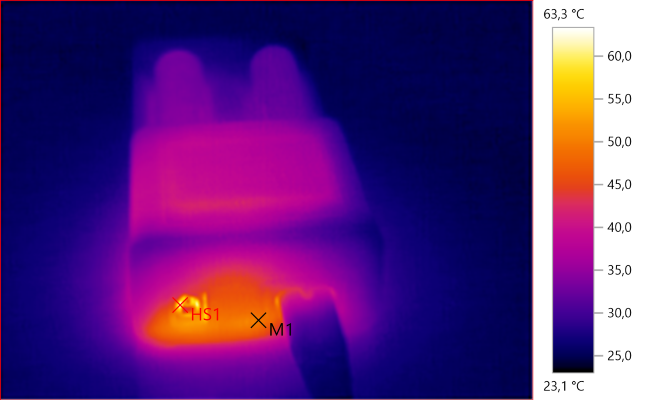 The current from a 12V power supply is also about 1A. 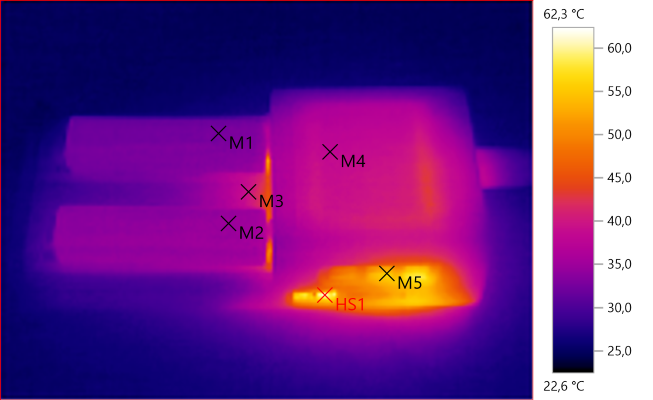 The charger gets a bit warm, but the batteries do not. The charger needs about 6 seconds to initialize. 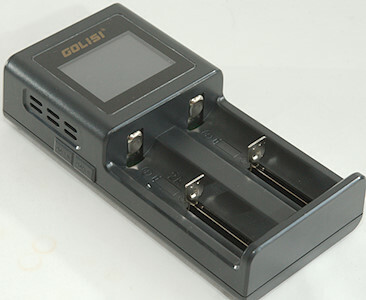 When putting two batteries in the charger the current will drop to 1A, it will not increase again if one is removed. The charger turns the current off to check the voltage. 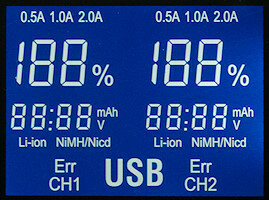 Charge current is 1A or 0.5A, depending on number of batteries. With one cell the charger current is 1A and the charger uses a -dv/dt termination. This is a good charge, stopping shortly after the temperature increases. The second slots looks the same. Both high capacity cells are handled the same way. 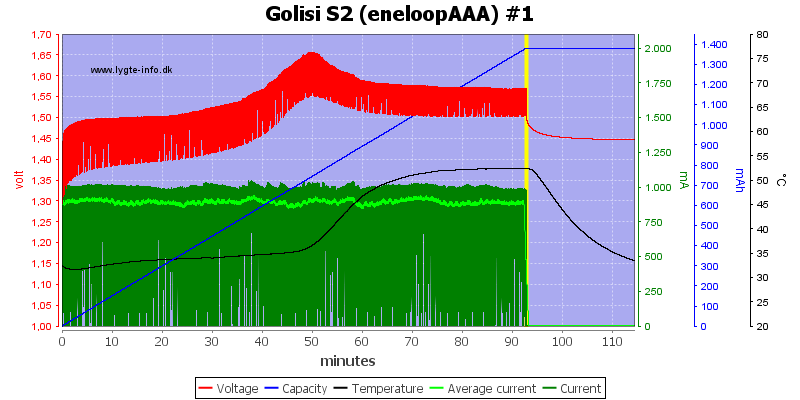 Oops, the AAA failed to termination, even though there is a very obvious -dv/dt signal. 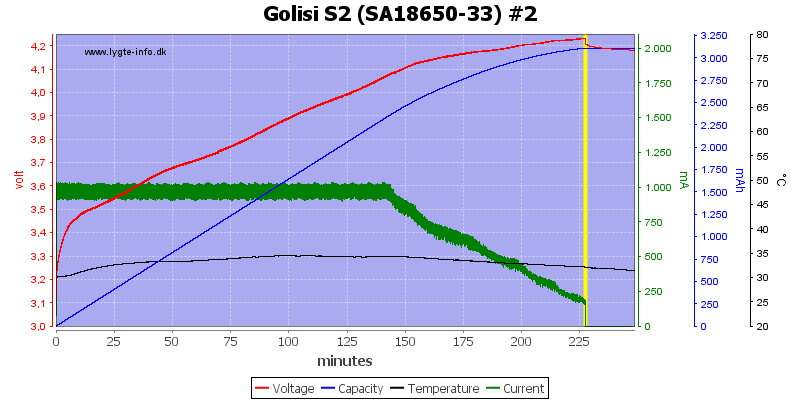 A full cell is detected in about 12 minutes, that is fast for a -dv/dt charger. 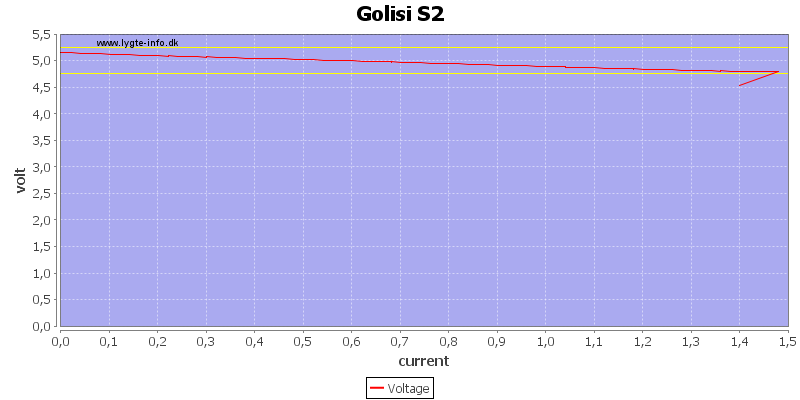 With two cells the current is reduced to 0.5A and the termination still looks fine. NiMH needs about 5 seconds to initialize. 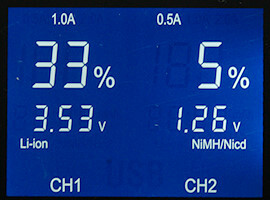 With NiMH the voltage check is done less frequently and takes longer. When putting two batteries into the charger the current will drop. 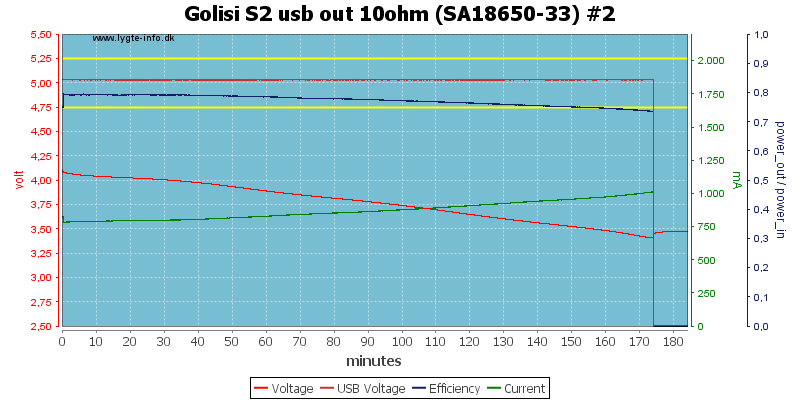 USB output is very sensitive, even a usb meter will turn it on, but it will power cycle every 15 seconds. Same with a battery in the other slot. 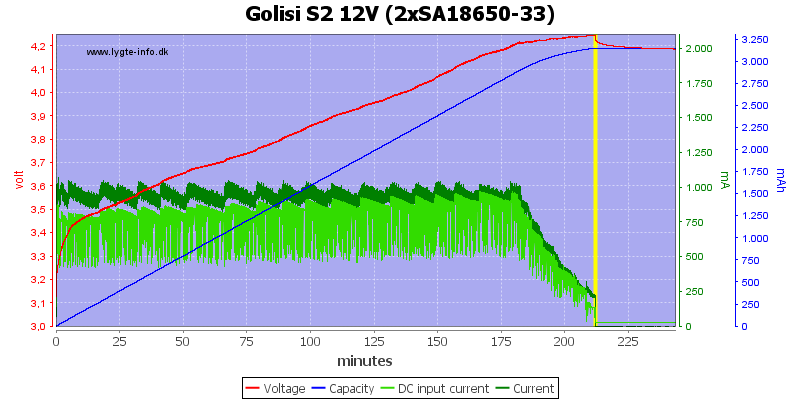 With 1A load and one battery the output has trouble keeping the voltage stable. With two batteries it works much better. With no load the noise is 32mV rms and 170mVpp. At 0.5A the noise is 94mV rms and 291mVpp. At 1A the noise is 31mV rms and 239mVpp. This charger is very simple to use, you just have to put the batteries in, this also means that current selection is fairly limited. With LiIon you can select between 1A and 2A for a single cell, depending on slot. With 1A being the minimum LiIon current this means the charger is bad for small cells. 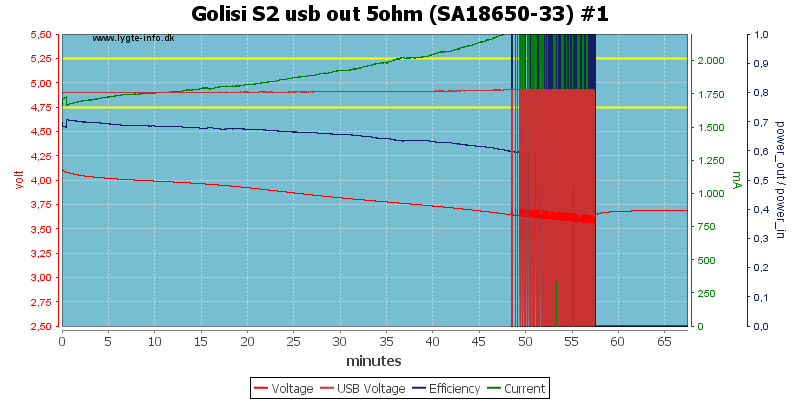 Mostly the charger did well, but it failed the AAA test where it missed the termination (it did terminate later on). 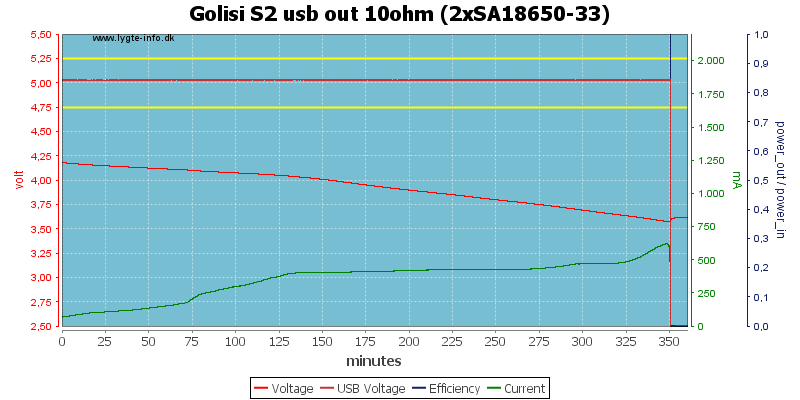 The usb output works fine with two batteries in the charger, but has problems with full current on one battery. The default is for the display to turn off while charging, this makes it impossible to see when the charger is finished without pressing a button. I will rate it as a fairly good and simple charger, but I am missing a charge done indicator I can see without pressing a button. 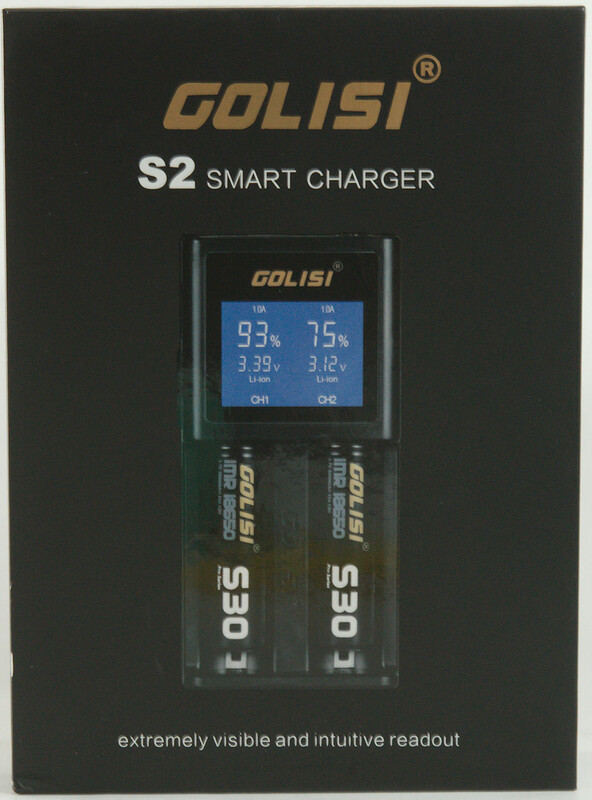 The charger was supplied by Golisi for review. It is possible to keep the background light on, just hold the button down for a few seconds and the auto-off feature is disabled. This is not explained in the manual!